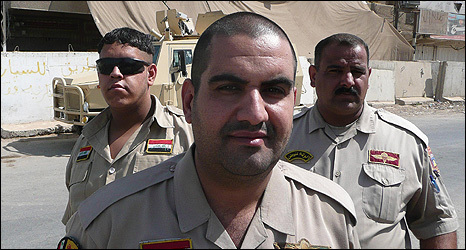 Abu Ibrahim brushes off the death threats, but is worried his men may "go bad"
From 1 October, more than 80,000 members of the Awakening movement start getting their pay packets from the Iraqi government, instead of from the US military who have been paying them up to now. The plan is to incorporate Awakening members - mainly Sunni Arab former insurgents who now fight against al-Qaeda extremists - into the Iraqi armed forces, but only 20% of them. The rest - tens of thousands of men who have been defending their communities - will continue to get their wages, until they find civilian jobs. I've asked three Awakening leaders about this. They are all unhappy. "What about the other 80%?" Abu Ibrahim al-Azawi asked. 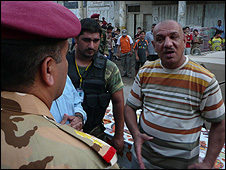 He is the Awakening leader in Ameriya, a former al-Qaeda stronghold in west Baghdad. He is afraid some of his men "will become bad people, like before". An Ameriya engineer who did not want to give his name is also uneasy. He says the continuing security of the neighbourhood relies on all the Awakening men, not just a few of them. He fears many will be bored, will lose their status, and may be tempted back to al-Qaeda. "Killing is a career," he said. And al-Qaeda are busy threatening members of the Awakening movement. While I was sitting with him, Abu Ibrahim al Azawi got a mobile phone text message from an al-Qaeda member. "We will put you in the sewer," it read, "like all unbelievers who sell their souls for dollars." The message continued: "You are the shoes of the worshippers of the cross." Showing the sole of a shoe is a profound Arab insult. "They are dreaming," Abu Ibrahim snorted. The Awakening - or Sahwa in Arabic - movement consists of former insurgents who used to fight alongside al-Qaeda in Iraq. Now they fight against them and with the Americans and the Iraqi forces. The movement was born after Sunni leaders realised that al-Qaeda were simply using the local population, and holding communities hostage, for their own extremist ideological purposes - not primarily to resist the American occupation. Saed Yussef al-Mutalebi - political adviser to the Iraqi National Security Council - remembers the first approaches from insurgents last year. 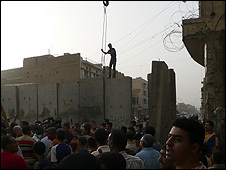 "One insurgency - or resistance - leader from the Fadil district of Baghdad was very frightened, simply for being with us." Fadil was occupied by al-Qaeda for months. Using a mosque as their headquarters, they bombarded local Shia neighbourhoods with mortar bombs, and stationed snipers on the rooftops. "There was vicious fighting, 194 people died in one single battle in Fadil," Mr Mutalebi told me. I went to Fadil this week. The streets were full of smiling people - Sunni and Shia together - celebrating a new alliance between the Fadil Awakening and the Sahwa group in the adjoining Shia neighbourhood of Abu Saifain. Hundreds of people swept back and forth, whooping and whistling as a crane removed a concrete "peace wall" installed last year to isolate the al-Qaeda fighters. Families leaned out of windows in buildings scarred by the impact of gunfire, and waved and put their hands on their hearts. Sections of the wall were swung aside one by one to the sound of vigorous drumming and triumphant tunes from two trumpet players who were held shoulder high. The Fadil Awakening leader, Khaled al-Qaisi, stood on the base of the crane and gave a passionate speech in which he said, "Iraq is one family, Sunni, Shia, Christian, Kurd and Turkmen." The crowd cheered and the trumpets sounded again. The leader of Abu Saifain's Shia Awakening repeated the message of unity when he spoke to me. But the Fadil and Abu Saifain leaders are both as anxious as the Awakening leader in Ameriya that too few of their members will be able to join the army or the police. "I advise the government to take us all into the armed forces. This is the only way to resist al-Qaeda," Khaled al-Qaisi said. "And Iran," Faris Abdul Hassan added. "We didn't fight our Sunni brothers, it was the militias like the Mehdi Army who did it, supported by Iran."